Siddharth Talwar; a man or should I call him a boy! I guess a boy would be the best designation for him because, at this age, he has engrossed the courage to follow his passion. For me, he is a recycled teenager who was born in Chandigarh and being an Army Colonel’s son brought up all over India. However, now a day’s living his cookery passion after achieving much success in his life. In spite of being a mediocre student throughout his entire education, he proved the phrase “Practice makes the man perfect” correct by grabbing a position in Master chef 5 Finalist List. 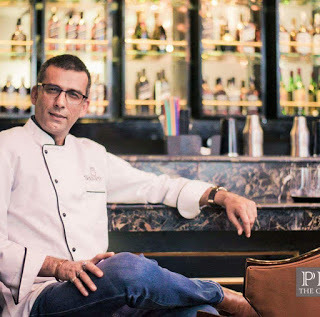 He started his food journey from a burnt ‘Bhindi Ki Sabzi and Roti’ though it wasn’t ‘Maa Ka Khana’ or ‘Ghar Ka Khana’, but that meal contented him the most, as he cooked for the first time in his life. He started cooking in 2001 when the company shifted him to the United States. That was his first Official Abroad trip. So once he began to culinarily, he never stopped. He kept on experimenting with multiple cuisines. Also, with his continuous practice, he kept on improving his cooking skills and nailed it to Master chef 5 with his self-developed ‘Lamb Shank Korma’ dish; a dish inspired from Europe and India. The dish was a fusion of two popular dishes ‘Lamb Shank’ from Europe & ‘Korma’ from India, collaborated to leave an essence of both the countries. He is a vice president of Eurasian Minerals & Enterprises Pvt. Ltd. by profession and currently, on a sabbatical to participate in the show. Ten years ago, he joined this company as a Junior Executive. He strived and became an essential part of senior management. He started cooking as he wasn’t getting up to the mark food in the US and was fond of homemade food. However, later on, developed his interest in culinary to the extent, he cooks thrice in a week and keeps a desire to open his culinary school. He also wants someday a student from his school should participate in Master chef. In his early age, he was not fond of studies. Due to this, once his father suggested him to do Hotel Management and opt it as a profession. At that time, he adamantly refused his father’s proposal and pursued his graduation in Arts from Allahabad University. However, who knew once a moment will come, when he will become an inspiration for several souls. Though he did not study thoroughly, he always makes sure his princess Kyra; who is the biggest motivation of Siddharth, should do well in her academics. He is pretty sensitive about his Barbie doll and loves her to the most. Whenever he talks about his daughter, sometimes he starts crying because Kyra is another life for Siddharth. Whatever he has achieved in his life, that’s all because of her. He has spent crucial years of his experience in the United States and South Africa where he continuously practised multiple cuisines. His determination towards his passion and profession is unbelievable. His clear thought process led him to qualify all the rounds of Master chef happened till date. He is not only good at his job but equally good in his passion. In the end, I must say, Siddharth Talwar who started his journey from a burnt dish is all set to treat his passion as a profession, and with his patience, hard work, determination and clear thought process is going to kill this competition.